Chakuli Pitha is a flat Oriya ricebased fried cake traditionally made in the state of Orissa. 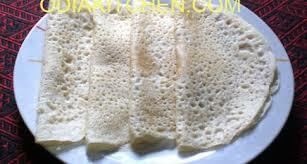 It is prepared using rice flour (arua chaula), black gram (biri dali), refined edible oil (rifine tela) most favorable will be ghee or mustard oil, and salt (luna). It traces its origin during early 4th century BC when Buddha had tasted the Chakra apoopa from two merchants coming from Kalinga Kingdom to Magadha.